Thai floor cushions are extremely comfortable!!!! The origin of Thai pillow making dates back many centuries. With the traditions of pillow making in the Northern Thailand areas of Chiang Mai and Chiang Rai continuing today to meet the demands of the local Thai market and an ever increasing overseas demand. Thai cushions are part of Thailand’s culture and can be found all over Thailand in many Thai homes and meeting places and are common in many neighboring countries. 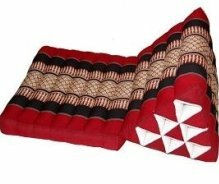 Triangle pillows and Thai day beds are used in many hotels, resorts, restaurants and especially in bars located near beach areas offering the most relaxing way to enjoy that afternoon drink with friends. 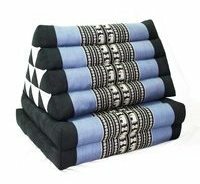 Thai triangle pillows or Thai cushions have become popular home décor accessories for many holiday makers in Phuket and Thailand. The smaller single triangle pillows are easy to transport but as you increase the folds they become a bit more difficult to carry. 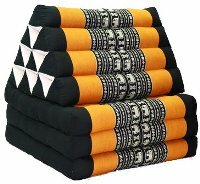 Thai cushions are usually filled with rice straw and kopak a natural fibre from the kopak tree making the triangle cushions very comfortable and durable. This short video by Jeff from of House of Thailand shows how the Thai floor cushions or ax cushion as they are known in some countries are made. Before you buy always beware of the customs requirements of your home country, in Australia the kapok and straw filling will need to be fumigated or quarantined. It is possible to bring them into Australia making sure you declare them on entry, customs will take them away for fumigating and post them to you around 10 days later and costs may vary depending on location. 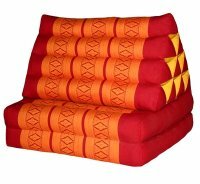 There is a variety of Thai floor cushions and Thai massage mat all of which come in many bright colours and sizes. 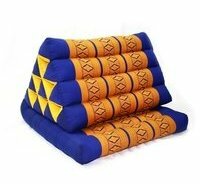 A standard 10 roll Thai pillow is ideal for using as a lounge or chair cushion. 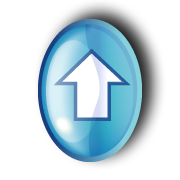 The standard size is usually 33 cm at the base with a height of 50 cm. 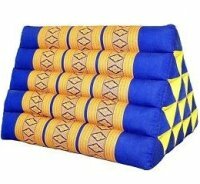 A Jumbo 15 roll triangle pillow is an excellent back and head rest. The size is usually 41 cm on the base and a height of 63 cm. 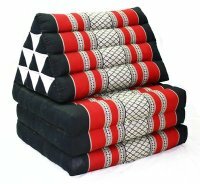 Thai cushions can be used in many ways with the different varieties available with the option of buying a one, two or three fold triangle pillow. The triangle pillow with one fold is popular for just sitting around or used when eating dinner Asian style. The standard size has a 50 cm base and is 80 cm high. The Jumbo is a more comfortable option with a 56 cm base and height of 91 cm folded. The 2 fold triangle pillow is ideal for kids or just sitting back relaxing reading a book, watching TV or using a laptop. The standard size 2 fold has a 50 cm base and a height of 127 cm folded and the Jumbo has a 50 cm base and a height of 138 cm folded. By far the most popular triangle pillow is the 3 fold commonly used as a day bed and offers the versatility in its range of use. 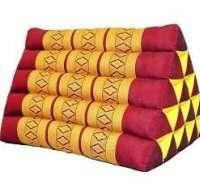 The standard size 3 fold Thai floor cushion has a 50 cm base and folded has a height of 175 cm with the Jumbo three fold having a base of 50 cm and a folded height of 185 cm. Warning: Thai triangle pillows and day beds can be very relaxing, sometimes too relaxing. 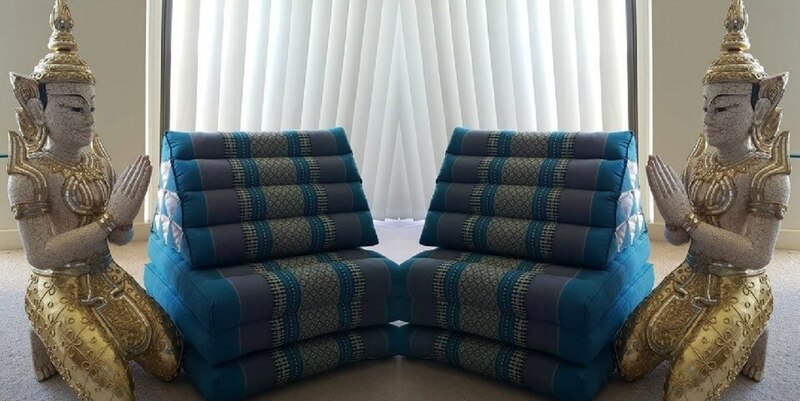 The following video shows how to make the most out of your 3 fold Thai floor cushion. 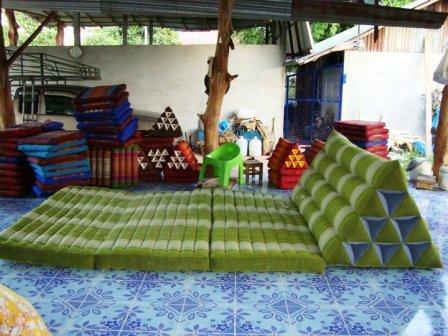 The largest Thai floor cushions we have ever seen are big enough to take all the family. Photo and videos by of House Of Thailand. With so many varieties of colour and sizes it is hard to pick a favorite. If you would like to purchase a floor cushion or pillow you can use the links above or contact the owner at Chiang Mai Craft by visiting their website. Which floor cushion do you like best? Let us know on our Facebook feed which pillows and combinations are your favorite.